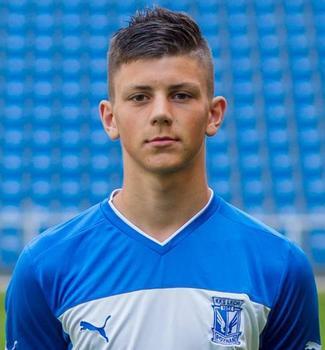 Dawid Kownacki is a youth product of Lech Poznań. He has been regarded as a huge talent for many years, and thanks to his good form shown in the youth team he was included in the club’s first team squad. . He made his senior debut on 6th February 2014 in a league fixture against Wisla Krakow – he replaced Kasper Hämäläinen after 83 minutes. Just two weeks later he scored his first league goal in a 1-5 loss to Pogoń Szczecin; thanks to that goal he became one of the youngest goal scorers in the history of the Polish top division, Ekstraklasa. It looks like Dawid will be a mainstay in the first team because his skillset is at an adequate level. He is also a top star of the Polish U-17 national team, which is seen as one of the most interesting young footballing generations in recent years. First team material in a top European club.